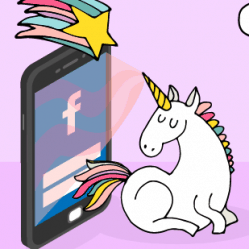 A way to turn your engaged Facebook audience into a contact list you can send mobile push notifications. 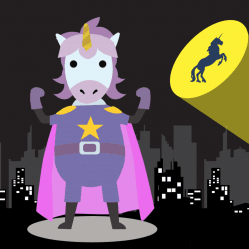 Despite its magical powers, few social media marketers have harnessed this glorious creature to their list-building advantage. Meet the MobileMonkey Comment Guard. It turns Facebook fans into contacts who you can message their inbox. 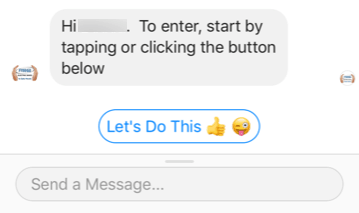 After enabling Comment Guard on a post, users who comments on the post will receive an automated follow-up message from your page in Messenger. If they respond to the message, they become a contact you can send follow-up messaging and future campaigns. 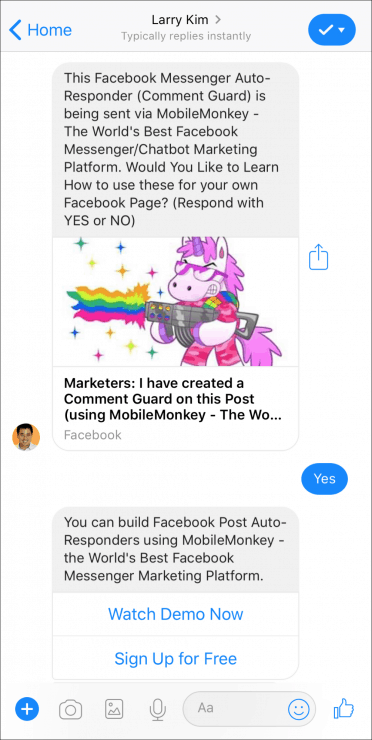 Messenger autoresponders are a relatively new concept for most Facebook users. 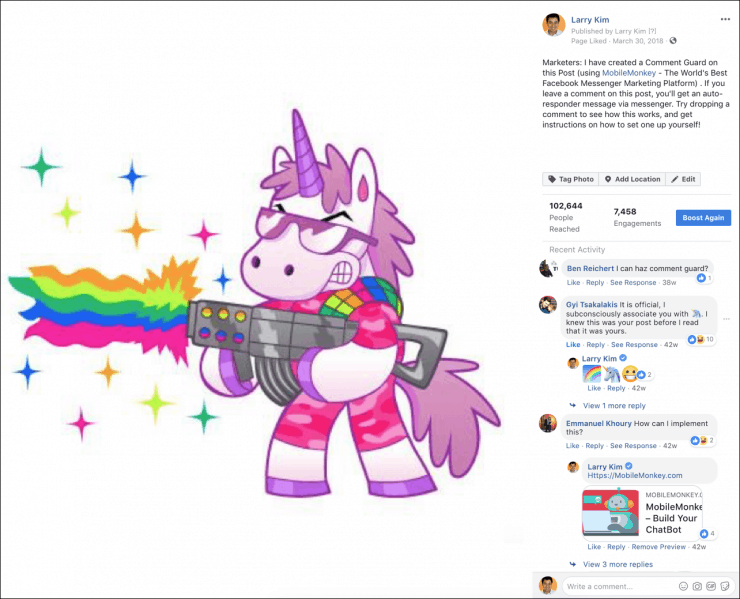 That’s why in this Facebook post, MobileMonkey CEO Larry Kim tells users exactly what to expect when they comment. He explains that anyone who comments will receive an automated response via Messenger and encourages his followers to take that action so they can see for themselves. The message reiterates that it’s an automated response, then asks users a simple yes or no question. And the question here is essential. One of the biggest benefits of using Comment Guard is that it builds your Messenger contact list. Users who receive your autoresponder are added to your list if they message your bot. This means the first message should not only give recipients a clear incentive to take some sort of action, but also make it easy to do so. When someone says “yes” the next message in the sequence includes links to a product demo and a signup page. This way, the user can easily take action and find the information promised in the original post. 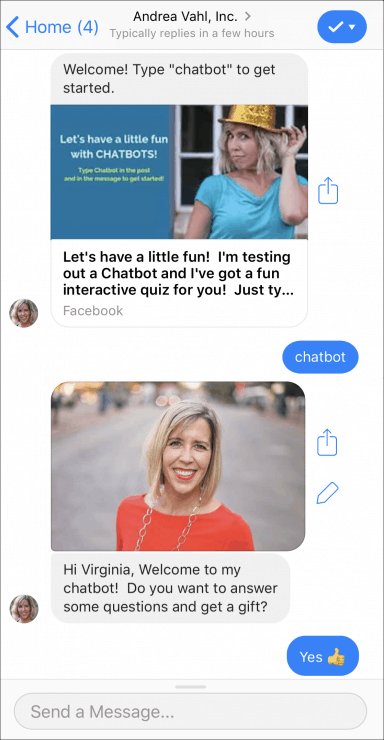 The dialogue continues with a demonstration through the bot of just how easy it is to fill out a form with a Facebook bot. The gold is that even after one leaves this conversation, they’re a Messenger contact for the page — so they can continue receiving messages and offers relevant to this interaction. Asking a question and requiring users to comment in order to learn the correct answer adds a bit of intrigue, as many of their followers will want to know if they’ve guessed correctly. And just in case that piece of information isn’t enough of an incentive for some of their followers, the post also offers a 20% off coupon to anyone who comments. Again, the goal is to craft a first message that generates a response. In this case, the autoresponder asks users to confirm that they want to know the correct answer to the question posed in their post. 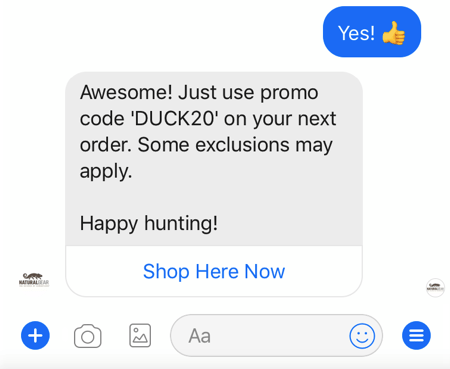 Once the user confirms, the page’s chatbot responds with the correct answer and asks whether the user wants a 20% off discount code. 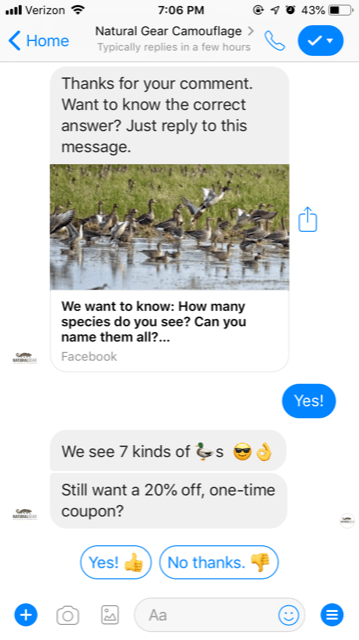 This way, Natural Gear uses their post to not only earn new Messenger contacts, but also drive traffic to their site that can translate into sales and other conversions. Props to the team at Big Tree Media for this ducking fope comment guard campaign. 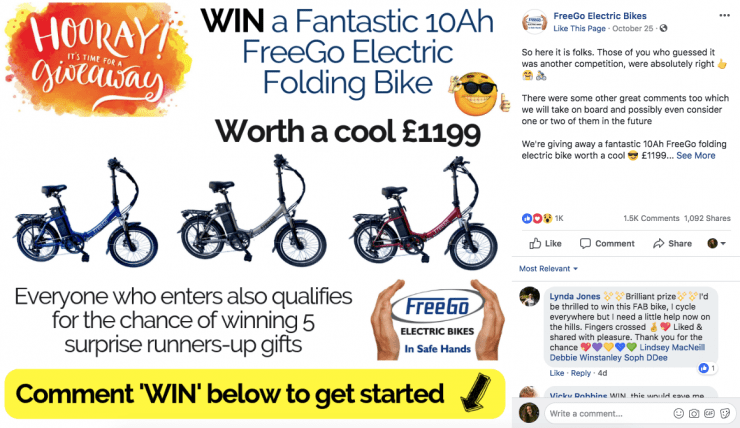 FreeGo Electric Bikes generates interest in their Comment Guard Facebook post by using it as the first step in entering a giveaway for a free folding bike. As far as incentives go, an electric bike is a solid one — and the post explains that all users have to do to enter to win one is leave a comment. You’re instructed to click a link to enter, which redirects you to a contest-focused landing page where you click a button. Tapping the “Let’s Do This” button starts the contest entry process. After a user clicks this button, they’re asked for a few basic details, including confirmation of their UK residency, email address, phone number, and whether they already own a bike from the brand. 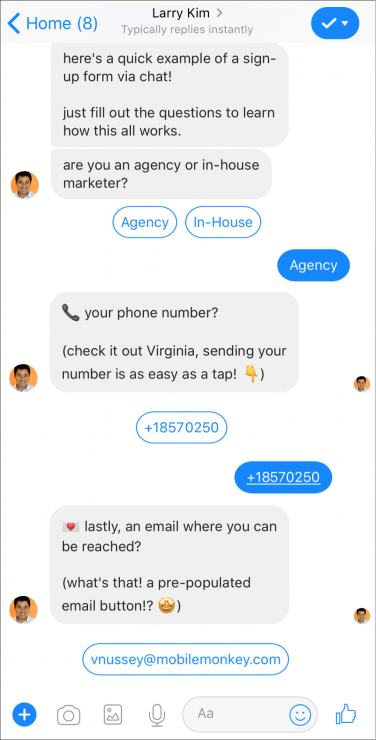 As soon as the user finishes providing all of these details, the chatbot responds with a confirmation of their entry. 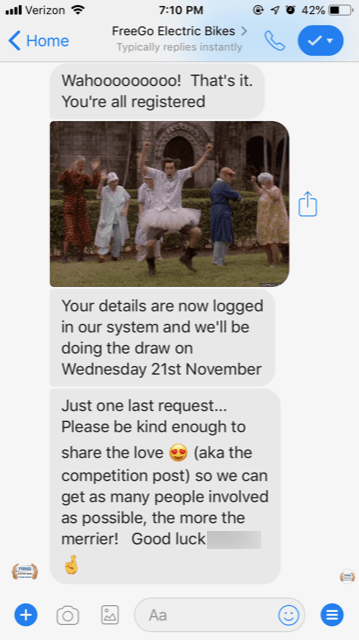 This final message also encourages users to share their original contest post to earn as many entries (and new Messenger contacts) as possible. The more the merrier indeed! In this post, author and speaker Andrea Vahl invites engagement with a simple Q&A that results in a free prize — access to her Facebook advertising course. At which point you’re invited to answer a few questions in exchange for a gift! Sign me up! Notice how Andrea’s bot is learning more about the person to see if they’re a good match for her solutions! 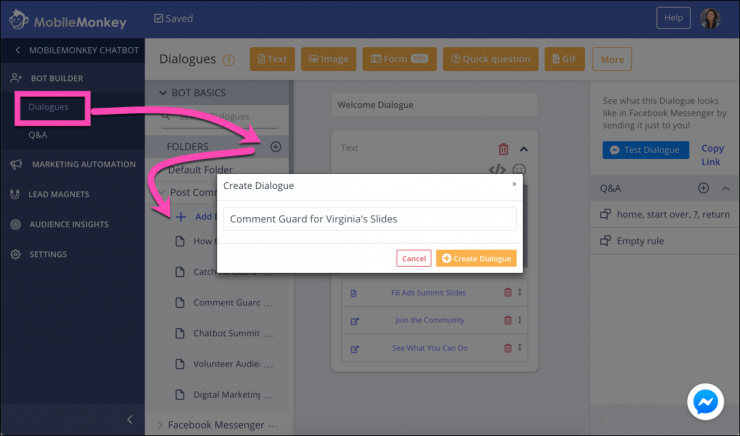 Kudos to Andrea Vahl and Chat Intelligence for this interactive contest guard. 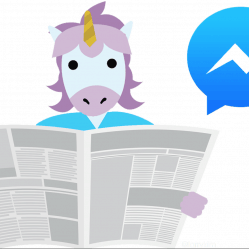 Last week, news broke about the integration of Facebook’s 3 messaging platforms. Larry delivers that news with a comment guard. Once you reply with the magic word, you get a link to read the article. Comment guards are an engaging way to juice up the exclusivity and anticipation for anything! 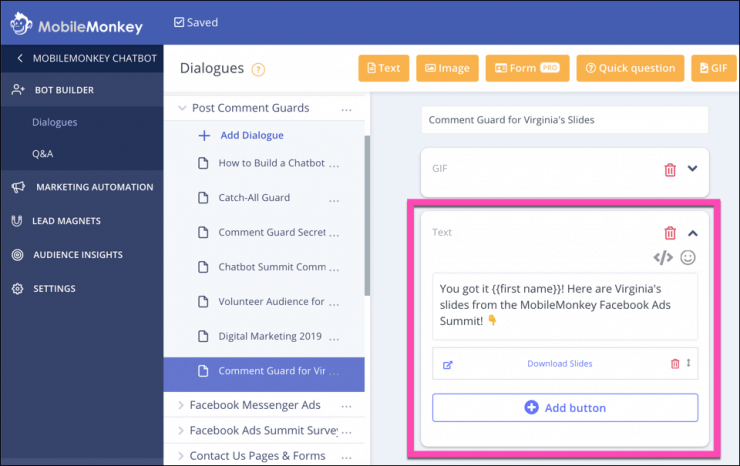 Use MobileMonkey’s Comment Guard feature to convert your commenters into contacts in four easy steps plus one optional bonus. First, you’ll need to create the content that people see after they have their first interaction of typing “yes” or whatever your magic word is. From the chatbot builder, create a folder that will contain all your comment guards, a helpful organizational habit. Then, build your page (or sequence of pages) to meet the expectations you set in your Facebook post. If you promised a discount code, for example, make sure to include that in your page’s content. 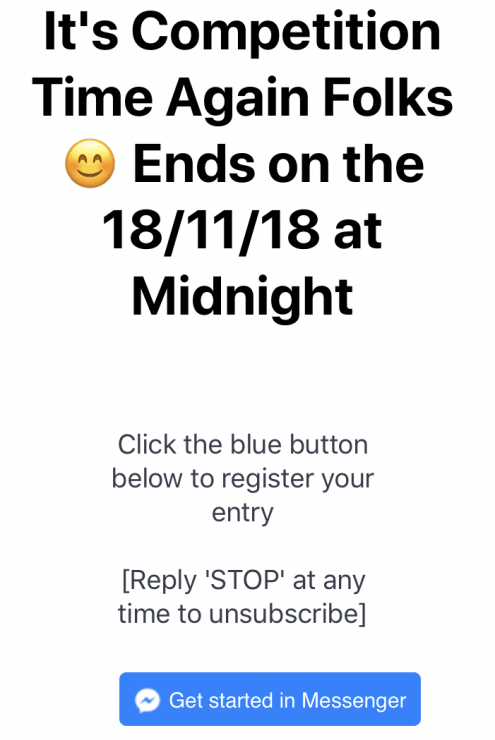 If you announced a contest, on the other hand, you’d want to either link to a relevant page on your site or create an entry form within the MobileMonkey builder. 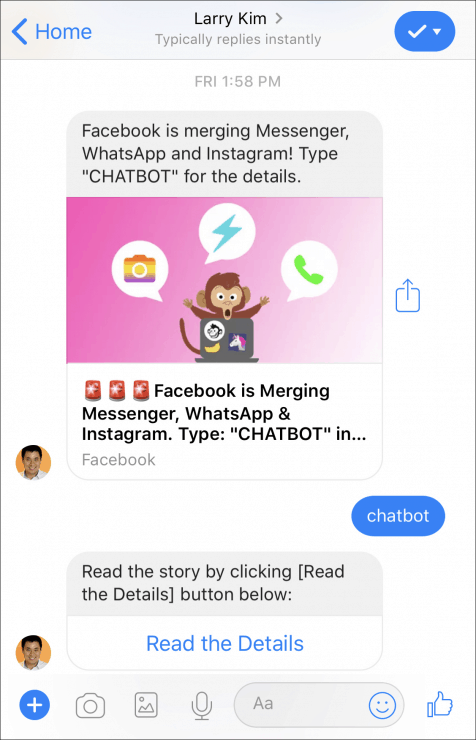 Regardless of the exact content you include here, you’ll want to make sure that your workflow ends with either a CTA or a menu to help users continue engaging with your bot. Larry Kim’s autoresponder, for example, ends with a link to his website for a demo. 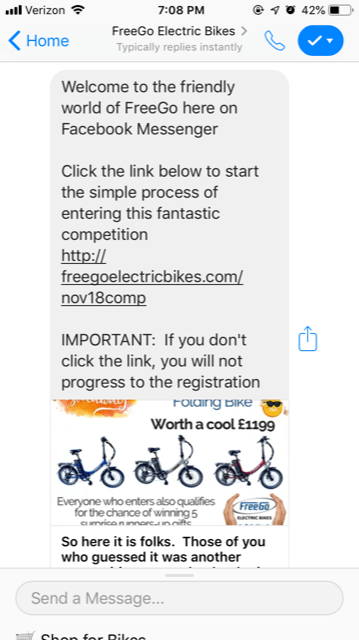 FreeGo Electric Bikes’ ends by telling contest entrants when a winner will be announced and encouraging them to share the contest with their friends. These are all slightly different approaches, but with the same end goal of keeping users engaged with the brand. After all, getting customers’ attention can be difficult — and you might as well encourage them to take action while you have it. So at the end of your workflow, add a button that tells users what to do next. Give your Comment Guard a name, then select whether you want it to apply to all of the posts on your Facebook page, or only to one specific post using a drop-down selector. If your goal is to replicate the approaches taken in the examples above, you’ll want to choose the second option. 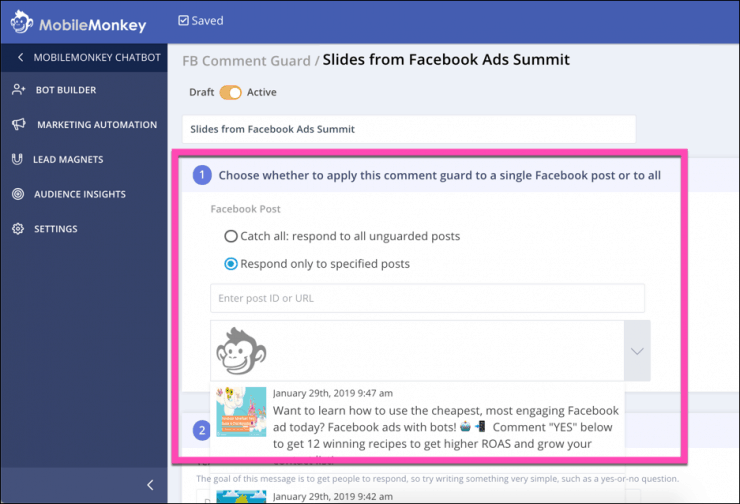 Building your Comment Guard around individual posts is the best way to deliver highly relevant content to your commenters and tailor your copy and CTAs accordingly. 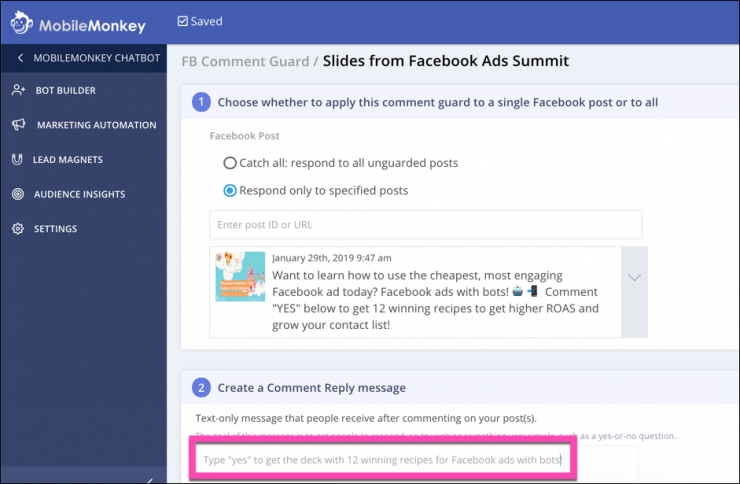 In all of the examples above, Comment Guard was used to deliver automated messages that were highly relevant to a specific Facebook post. And part of what made each of them effective is that they gave users a clear incentive to comment. 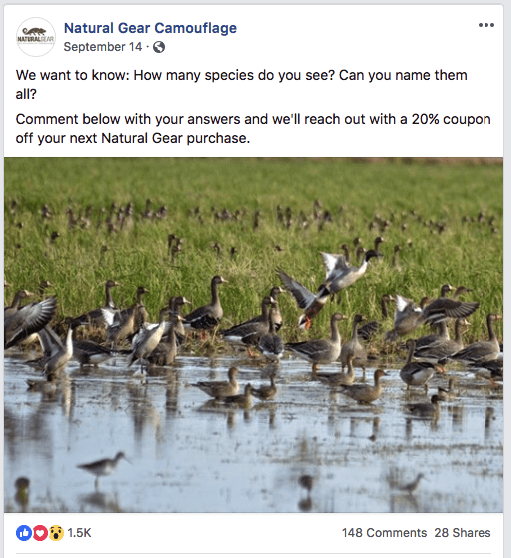 The Natural Gear post, for example, offered the answer to a fun question (plus a 20% discount code), while the FreeGo Electric Bikes post offered entry into a contest for a free bike. Though their approaches are slightly different, the common theme here is that commenting on either of them benefitted users in some way. And you should aim to do the same with the posts you Comment Guard. So for the best results, don’t simply select an existing post on your business page. Write a new one that’s designed to generate comments, whether by offering a discount, promoting a contest, or even simply asking your followers a fun question. Then, select that page in the Comment Guard Builder. Then, you can tailor your autoresponder comment to the content in that specific post. In order for Comment Guard autoresponders to turn commenters into Messenger contacts, users need to respond to them. So before directing commenters to the information or offer described in your Facebook post, you should always ask a simple question. This is the first thing someone will see in the Messenger inbox after they leave a comment on your Facebook post. Have it match your original magic word to simplify the process and give the user less to think about. Do you want this post to show to people every time they comment or just once a day, or once an hour. It’s up to you, depending on how often you think people will want this interaction. 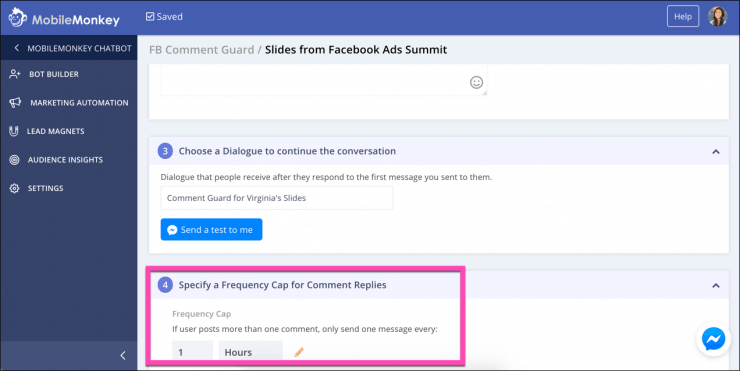 Coming up with a strategy to drive engagement on your Comment Guard Facebook posts takes time. You may need to experiment with a few different copy and image tactics to see what generates the most comments from your followers, and a few autoresponders to see which is most effective at driving responses in Messenger. So once you’ve found an approach that works, it’s in your best interest to make sure that winning post reaches as many users as possible. And that’s where Facebook’s Boost Post option becomes extremely useful. Next scroll down to the Audience section and determine who you want to target with your post. 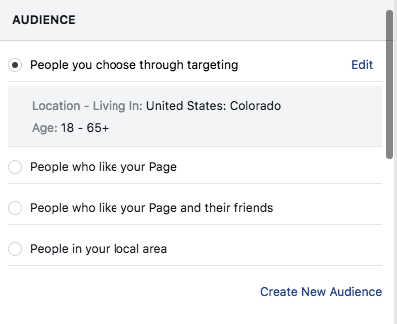 Use Facebook’s demographic targeting options to create a new audience, or use an existing audience you’ve used for past campaigns. You can also use it to target users who like your business page, to narrow your audience down to people who are already familiar with your brand. 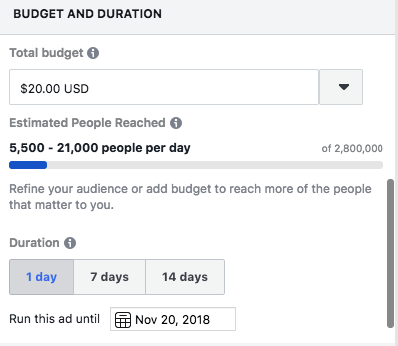 Finally, you’ll need to set a budget and duration for your boosted post. If your post is at all timely or time-sensitive, you’ll want to keep this window relatively short, for a time period as small as one day. Otherwise, boosting your post for a week or two can help you maximize your reach over time. 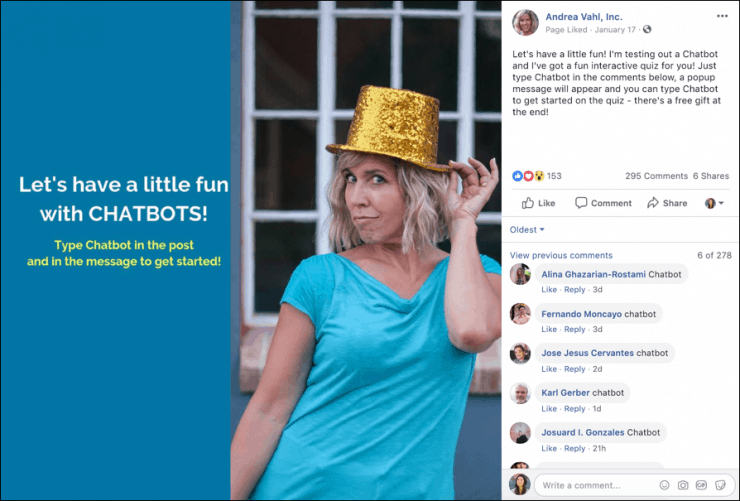 Preview your boosted post, then click Boost to launch your promotion — and to start earning more comments and Messenger contacts from a post that’s already proven itself effective. By the way, did you know you can do comment guards for FREE in MobileMonkey? Convert Your Commenters into Contacts! 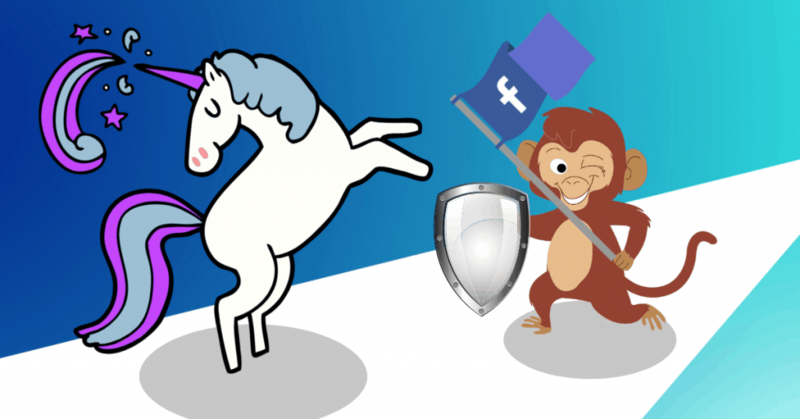 Get started with MobileMonkey for FREE and build your first Comment Guard today! 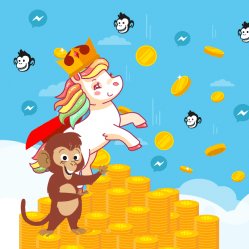 Sign up for occasional Facebook Messenger news updates from the MobileMonkey team. very wonderful and useful content.